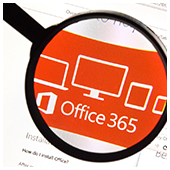 There’s a lot to like about Office 365. You have access to cloud-based productivity suites, Microsoft email servers, SharePoint, and more. But not all Office 365 license plans offer the same features and services. When looking for an Office 365 plan for your business, make sure to follow these tips. Although it may seem like Enterprise subscriptions are superior — and in some ways they are — Business plans are perfect for smaller companies running on a tight budget. Office 365 Business and Business Premium cost $10 and $15 per user per month respectively, while E5, the biggest Enterprise plan, costs $35 per user per month.